Thanks to our friends at or Google+ communities and feature it on Photofocus! Then each month well open voting from the community. 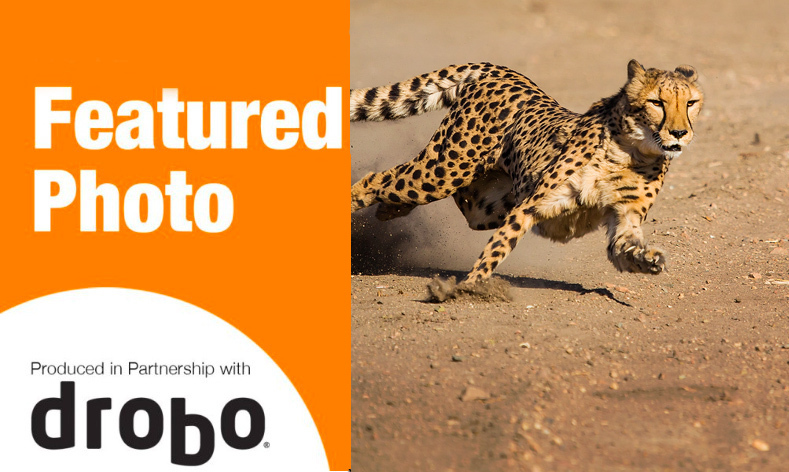 The top vote getter will win a special prize from our partners at Drobo as well as a profile story here on Photofocus. Today’s featured photo is by the talented Susan Koppel, a retired aerospace engineer and flight instructor, living in Reno, Nevada. I am an animal keeper and photographer at the Animal Ark Wildlife sanctuary outside of Reno, Nevada (www.animalark.org). They rescue non-releasable wildlife and give them a home for life. They currently have two cheetahs, Moyo and Jamar, that get to run for exercise. Its been proven that cheetahs in captivity that are able to run live much longer and stay healthier. Animal Ark is unique in that the cheetahs run totally off-leash in a large area. We have spectator bleachers and in 2011 installed photo blinds. The cats run in a U shaped course, with the photo blinds at the bottom of the U. Since 2011 we have had hundreds of photographers come through to capture these beauties. To see more of Susan’s pet photography go to www.susankoppel.com. For more info on the Featured Photo Contest, click here.